The third edition of The WTO Dispute Settlement Procedures collects together the treaty texts, decisions and agreed practices relating to the procedures that apply in the settlement of WTO disputes. It affords ready answers to technical questions relating to matters such as: how disputes are initiated and conducted, including at the appellate stage; what deadlines apply and how to calculate them; what rules of conduct bind individuals involved in WTO dispute settlement; and what rules of procedure apply to meetings of the Dispute Settlement Body. 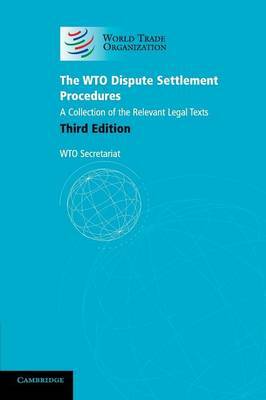 This highly practical work, which includes cross-references and a subject index, will prove invaluable to anyone working in WTO dispute settlement, including lawyers, civil servants working in the field of trade, economists, academics and students. This edition has been fully updated to take account of revised rules and procedures.